The Blue Line won't be extended, but MOA could share terminal status with the Riverview line in the future, so leaving the room for an additional platform (but not building it on speculation) is a wise decision. It seems short-sighted to spend a bunch of money fixing the station area but, as far as I can tell, not doing anything to improve the 2mph crawl into/out of the station. What could realistically be done about that? Not sure, because I've never been sure if it's just the tightness of the turn that makes it go that slow, or if there's other factors. If it is just the turn radius, I would think they could sacrifice a dozen parking spaces or so to open it up a little. Silophant wrote: Not sure, because I've never been sure if it's just the tightness of the turn that makes it go that slow, or if there's other factors. If it is just the turn radius, I would think they could sacrifice a dozen parking spaces or so to open it up a little. The slow crawl into the transit station might be more tolerable if the train hadn't just stopped 3 other times in less than a mile for 1. a Stroad, 2. an office building with a sea of asphalt, and 3. a park-and-ride, all while travelling at slow speeds around corners to avoid empty lots. I know that they were trying to avoid cutting up available lots, but the speed of movement south of the airport is just atrocious. At least when entering the mall terminal station, the slow movement can be justified as an attempt to not slam into the end wall. Exactly. It's bad enough that Downtown has stops 1-2 blocks apart, but it's the densest place in the state. It's madness that Bloomington has the same stop density. Bloomington Central should have been decommissioned when American Boulevard opened. Or American Boulevard shouldn't have been opened. Whichever. Also nuts: the train getting hung up at the 494 interchange every single time. To bring my comment back to the actual Mall transit station, I always thought they should parallel 82nd street after the park-and-ride and bring the train in under 24th to a station platform that is perpendicular to the current platform. This would eliminate 2 90 degree turns and the at-grade crossing of 24th so the speed into the mall should be much better. In the future, if we decide to continue the blue line (or riverview), you could extend the tunnel out from under the mall and send it in any direction you need to. That would of course be expensive and possibly difficult depending on what sort of supports they have under the mall, but it would have greatly improved speed entering the mall and given freedom for future expansion. There's all sorts of problems before the train leaves 28th Ave Station but the part between there and the mall seems the most egregious to me. Obviously the red line I drew would require a fair amount of work, I don't entirely understand the grading of everything here (the train enters the mall at ground level but is also the basement) but dipping under 24th Ave S parallel to (but not necessarily adjacent to) E 82nd St would save a ton of time (and traffic disruption). Would be a lot of work under the station involving turning the platforms 90 degrees I would imagine, and would also totally cut off the idea of through running some service beyond the mall. Obviously that's not in the plans now, but realigning the platforms would seem to me to be a 100 year investment rather than a 10-20 year investment like this current update is, so looooong term plans would need to be taken into consideration. Or maybe you could line everything up in the station area such that you make slow sharp 90 degree turn direction onto the existing platform, but that would take the path across that parking lot pretty far south and certainly make any plans to redevelop that lot more complicated. BoredAgain wrote: To bring my comment back to the actual Mall transit station, I always thought they should parallel 82nd street after the park-and-ride and bring the train in under 24th to a station platform that is perpendicular to the current platform. This would eliminate 2 90 degree turns and the at-grade crossing of 24th so the speed into the mall should be much better. Listen, I'm not trying to say your point isn't valid - it's just that it lives outside the world of reality. This conversation has been hashed out many many times over the years. But seeing as how there is ZERO chance of the Feds/State finding > $100 million to move the line to that location, not to mention creating a new transit hub, capable of handling the bus traffic that happens... it's best we focus on reality. The stretch through Bloomington might be intolerable to most, but realistically, it supports the long-range plans the City has for this area. The planned infill over the next 20+ years makes that stretch tolerable to me. The slow corner is definitely a result of the tight corner to turn into the station. Again, relaxing the curve, if there was ever appetite, would have happened when Oberstar got $50 milllion to extend the line into the MOA back in 2002 time frame, when they created the curve. I feel like people have these ideas - and act or write as though no one ever thought of them before. Back in the late 90s/early 2000s when the line was being planned, the MOA expansion plans were to expand east - not north. So the current transit station was the ideal spot. After the new MSP runway took shape, and MAC and MOA swapped land to make that happen - the MOA's plans changed. The parking ramp's low ceiling (for trains) and grade change along the 24th Ave stretch made coming in at that tight angle likely the only option. It is what it is, and so upgrading the 12 year old station, sorely needing a face lift, to be more engaging and productive, is a very smart long-term investment. If all the pie in the sky ideas are removed from the equation. I ride the line daily to the MOA in the morning, to catch a bus westward, and then transfer back to the train in the evening. While the south end can take 6 minutes from MOA to 494, it's hardly a nuisance! And I also have issue with inflammatory statements that the LRT is stopped at 494 'every time' ridiculous! I'd say my average is about 25% of the time. And that's hardly on Metro Transit. That's MNDot and Bloomington. FYI, your map roughly shows the original plan to end the line, except the plan had it end in the empty lot across from the parking ramp - connected via skyway. The grade difference between 82nd and where the train platform would need to be under the ramp would not work. We're all in agreement here about the entire Bloomington alignment, stop spacing, and crawl into the mall. It's a mess. If the 28th Ave P&R had instead been built a block further west (at the corner of 82nd and 24th), the ground floor of the ramp could have served as the MOA's transit station, connected to the mall by skyway. That would cut off several minutes right there, and put a more reasonable distance between the P&R and Bloomington Central Station, which are comically close today. And you can easily imagine how Bloomington Central and Am. Blvd. could be a single station, either directly in front of Reflections condos or the existing BCS location. American Boulevard Station should not have been added...like who the hell does that serve that can't walk to Bloomington Central Station? Pretty much the Embassy Suites and... absolutely nothing else. twincitizen wrote: If the 28th Ave P&R had instead been built a block further west (at the corner of 82nd and 24th), the ground floor of the ramp could have served as the MOA's transit station, connected to the mall by skyway. That would cut off several minutes right there, and put a more reasonable distance between the P&R and Bloomington Central Station, which are comically close today. The P&R was never an option on this land - as it was owned by MOA. So as much as I might agree, it was not an option when the line was being proposed/built. 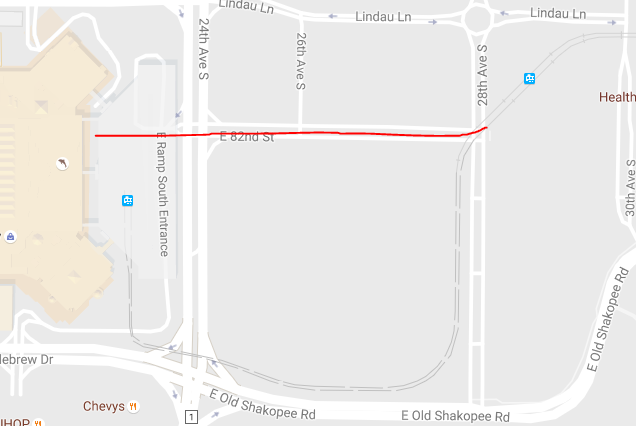 It's 3-4 minutes just between the MOA and 28th Avenue Park & Ride (if you don't believe me go look at the Blue Line schedule on the Metro Transit website), but that depends on how long a southbound train has to wait for a northbound train to clear the interlocking. A smart long-term investment would have the MOA light rail platform in a location where extending the line is much more doable, the travel time is more tolerable, and traffic isn't disrupted as much (especially if Riverview is LRT). For me it's been 50-60% of the time the train has to wait at 494, because I guess Bloomington can accept motorists having to wait at 24th Avenue but not 34th Avenue. I don't know if the MOA or Bloomington has any plans for that empty lot, but I believe the wisest investment is what I mentioned above. It's not pie-in-the-sky, its a sensible plan. HiawathaGuy wrote: Listen, I'm not trying to say your point isn't valid - it's just that it lives outside the world of reality. This conversation has been hashed out many many times over the years. But seeing as how there is ZERO chance of the Feds/State finding > $100 million to move the line to that location, not to mention creating a new transit hub, capable of handling the bus traffic that happens... it's best we focus on reality. I'm sorry. I didn't realize that we should limit our discussion to approved budgets within planned schedules. I think that the planned upgrade will improve flow within the transit station itself. I think it will do little, if anything, to improve speed of train movements pulling into the station and I know it won't do anything to improve train speeds or crossing requirements outside of the station. There were many choices made in the design for transit in the area that I think could have been done better, similar to the discussion of the "East Town" platform and surrounding plaza design that was discussed in the relevant thread. "Slightly" bigger budgets years ago used to fix really expensive and difficult problems now. I think if discussions want to be had about pie in the sky ideas - or unrealistic options - they belong elsewhere. I'm not opposed to having a forward thinking discussion - but it's tough to intermix the two. MOA owns the property to the east of the parking ramp, again. So I don't think any transit use will be happening there. I also think that expecting plans to have been developed better, when MOA was resistant (and still is, to a similar degree) to having the transit station in the lower level, is a bit tough. Metro Transit cannot force MOA to do anything - in fact, they aren't paying for any of the upgrades about to start. That's the risk we take with having our busiest transit hub a part of a huge privately held complex. So this idea that we should've 'done it better', assumes that that was even an option. Which it wasn't back in the late 90s/early 2000s - when the line moved from ending across from the MOA, with it going into the lower level of the parking garage. Which took a lot of arm twisting with MOA owners to make happen. The upgrades to the transit center are by far more for the bus riders, which are far greater in number, than the train rider's slow entrance and exit of the platform area. Buses have to wait far too long for train crossing gates & mixed-traffic security - causing huge waste in efficiency. The LRT portion works as good as it can, given the circumstances. Just made it from Terminal 2 to American Boulevard without stopping at 494. I retract my previous complaint. HiawathaGuy wrote: I think if discussions want to be had about pie in the sky ideas - or unrealistic options - they belong elsewhere. Proposing a station in the empty parking lot isn't pie in the sky. Proposing a station inside Nickelodeon Universe would be a different story. Keep in mind that the rail crossing at 24th Avenue also delays buses a bit, I know from experience (routes 538, 539, and the Red Line have to deal with this). So why not kill off two major sources of delay with a station in the empty lot? Plus it's not like the transit station would take up all the empty space. My reality is the fact that MnDOT uses or moves $3.3 billion in funds annually, about 90% of which is spent on roadways, planning, and debt service. I feel we're artificially limiting our thinking if we aren't considering the possibilities that would be available if we had a similar statewide budget for local and intercity transit. It's fine to acknowledge existing constraints and do the best we can within them, but it's a useful exercise to think beyond what's currently practical. But even if we had an extra couple of billion dollars for transit laying around, does any of this really rise to the level of priority that you'd one of these plans? I suspect that when the Central Station area eventually gets built out, the worry about this will diminish significantly.